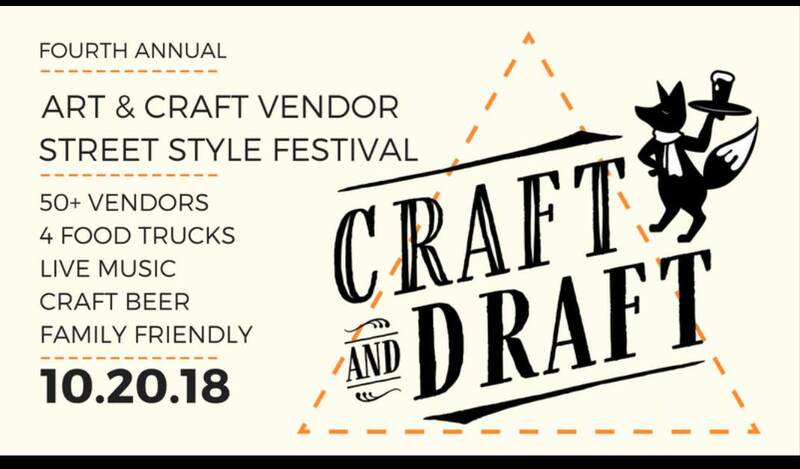 Join us for the Fourth Annual Craft and Draft on Saturday, October 20, 2018 in 3rd Avenue parking lot (also known as the Taylor Office Supply Parking Lot) across the street from Green Heron Arts and Brad's Barber Shop in Radford, VA. Craft and Draft is the premier street style festival featuring 50+ artist and craft vendors in downtown Radford! Plus live music all day, food trucks, and craft beer on tap! With a variety of modern hand-crafted and one of a kind vendors, you can expect to find jewelry, clothing, letterpress, illustration, home goods, and so much more! On site food trucks include Thai This, Big Roosters Wings & BBQ, J&D's Rockin' Weenie Wagon, and Scott Doggs! Plus all day live music, including The Antecedents who were featured as an On The Rise band at Floyd Fest this year, Jared Stout, Flannel Jukebox and The Koontz. Flannel Jukebox is a rock band based in Blacksburg, VA. Playing songs from Led Zeppelin, Aerosmith, Tom Petty, The Beatles and more. Enjoy your shopping with craft beer on tap! Craft beers include Britchin Brwon, Ballast Point Fathom, Buskey RVA Cider, Ballast Point Pumpkin Down and Our Daily Pils. Each year, Craft & Draft proudly donates a portion of its proceeds to a local non-profit! Donations accepted at the gate. The event is family friendly, dog friendly and people friendly! The Third Avenue Parking lot is located directly across the street from Green Heron Arts at 111 3rd Avenue in Radford, VA.
To view the event flyer, visit: https://i.imgur.com/Fpj4CDe.jpg. For more information at: https://greenheronarts.com/craftanddraft or https://www.facebook.com/RadfordCraftandDraft/ or https://www.instagram.com/radfordcraftanddraft/.